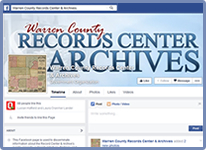 We are happy to announce that the Warren County Records Center and Archives is officially on Facebook and Wordpress. Social media is the quickest way to reach current and potential patrons. 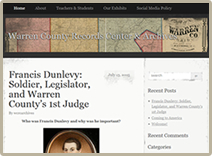 As our department works to evolve into the digital age, it is our intent to attract not just individuals interested in their family genealogy, but also those interested in the rich history that Warren County government has accumulated over the last 200+ years by attracting a wider range of educators and historians. These pages, alongside our official county website, will allow us to interact more with our users to publicize information about the records center, our growing digitalization projects, our educational outreach program and new exhibits to a broader audience, quicker. Check us out and don’t forget to Like Us on Facebook!